No doubt dotmailer is one the most popular and yes effective email marketing tool, people consider it to be one of the efficient ways for their email marketing campaign. It contains an overall 4.5 rating from its customers all around the world. It got tons of appreciations from the users like its interface design is clean & organized, its email automation programs are awesome, flexible segmentation builders and a lot more. But the question is that, if dotmailer is really an awesome service then why every month more than 500+ users are searching dotmailer alternatives? The reason behind this is that some of the users of dotmailer are not happy with its email editor functionality as it is limited and a little complex. No analytics to track the open rates. It doesn’t provide autosave functionality. It is really very disappointing and results people are moving to another service. Let me show you these alternatives via the comparison table. The table contains features comparison, pricing comparison, number of subscribers and many more. So, now these are the reasons to switch from dotmailer to other email marketing services. In this weblog, we have compiled a list of 10 best email marketing service which you can consider as the best alternative to dotmailer. We have tried and tested each of these services. Also, you can trust these services for their fast & responsive email creating, best scheduling functionality, assured inbox delivery, clear reporting, and affordable pricing! Now, let’s start with the list of 10 Best dotmailer Alternatives one by one. 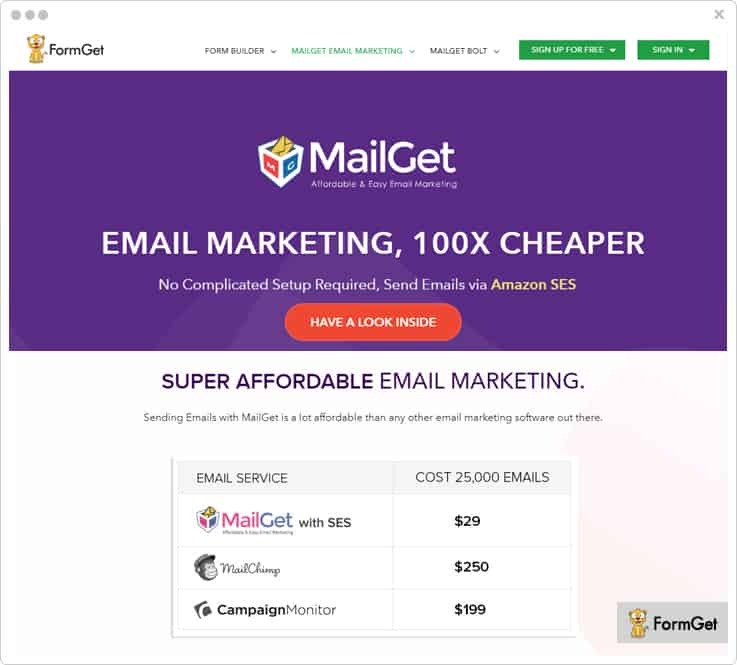 If I compared MailGet Bolt with dotmailer then it must fit on comparison as it is really affordable and provides tons of useful features which is required on any email marketing service. This software contains 500+ email templates which let you create bulk emails via its drag & drop email editor. However, after creating the emails you can immediately deliver your emails or can schedule for later. Further, this service comes with an in-built SMTP so that you don’t need to add an additional SMTP Relay Service to send the emails to the clients. If I come to its popularity, then yes, it’s popularity is increasing day by day. Every year or months more than 15 million internet based companies like Avaya, Cisco, The Guardian etc. are using this software to create & send emails. Its drip functionality permits you to add it on emails to automatically deliver emails at a various platform in a scheduled time interval. Autoresponder is one of the most important features of MailGet Bolt with which you can automatically deliver emails to your client if required. List cleaning is its another feature that lets you remove bad and inactive emails to stop bounce & spamming rates. It allows you to add an unlimited custom field on your email marketing templates as per your choice and requirement. MailGet Bolt comes with various integrations such as Zapier which lets you connect multiple apps such as Google Analytics, Wufoo, MailGet API and more. Starter Plan – Its Starter Plan will cost you $9 only with which you can send emails to 2,500 subscribers. Rookie Plan – To send emails to 5,000 subscribers this plan will charge you $19/ month. Pro Plan – For 10,000 subscribers you will be charged $34/ month. Advance Plan – This plan will charge you $49/ month to send emails to your 15,000 subscribers. [Note: The advance plan has got multiple other packages with which you can handle 20,000 to 200,000 every month at varied pricing]. 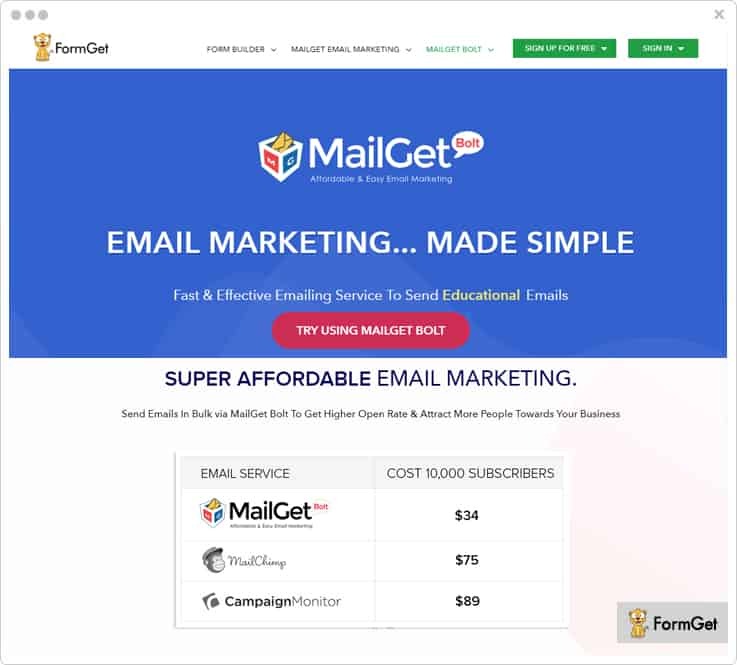 Email Marketing by MailGet is one of the easiest & smart way for marketers to create & send transactional, promotional, educational emails to the recipients as it comes with 500+ email templates. It is considered one of the best & cheapest email marketing solution over the internet. As compared to others MailGet is 100x cheaper mailing service. It offers easy to use drag & drop email builder and supports MX list cleaning facility. Further, you can also integrate multiple SMTP services such as Amazon SES, Zapier, MailGet SMTP etc with MailGet. It provides an automatic follow-ups email option with which you can send follow-ups emails to your customers who have not opened your emails. MailGet also comes with an in-built lead capture tool with which you can achieve more subscriptions from your site. Once done with creating, you can send the emails directly to the recipients or schedule for later as well. MailGet allows you to schedule the email so that you can send those emails immediately or later. Its autoresponder feature lets you send emails automatically to all subscriber. So, you don’t need to worry anymore. Starter Plan – To send emails to the 5000 subscribers it will cost you $5 every month. Rookie Plan – This rookie plan will let you send emails to 25,000 subscribers at $29/ month. Pro Plan – To send emails to 50,000 subscribers, this service will cost you $49 every month. Advance Plan – This advance plan of MailGet software will charge you $79 to send emails to 100, 000 subscribers. 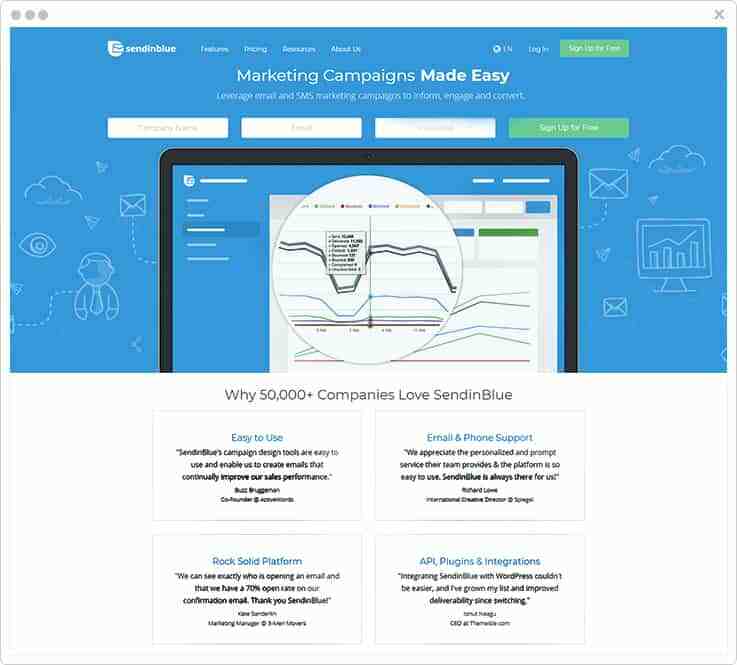 SendinBlue is the most popular email marketing as well as short message service provider which includes things like drag & drop editor, templates, inbox preview, etc. It has numerous templates on its template gallery so that you can choose the templates for emails according to your choice. You can use its drag & drop editor to create the emails in just a few clicks. It comes with an inbox preview feature which lets you test & optimizes your email campaigns before sending to your customer. SendinBlue offers an autoresponder functionality which enables you to respond to your customer via delivering automatically emails. Create automation workflow designs by creating multi-step, multi-channel, campaigns with unlimited variables. Get real-time reports of your email campaigns to know how your emails’ performance & the number of openers on a geographic map. Lite Plan – This plan is perfect for new marketers. It allows you to create & send 40,000 emails per month by simply paying $25. Essential Plan – This plan is ideal for growing businesses which lets you create 60,000 emails every month on $39 only. Premium Plan – It cost you $66 to create & send 120,000 emails per month. In fact, this plan is most popular and is the best solution for marketing pros. Enterprise Plan – This plan will let you create 350,000 emails every month but its pricing is confidential so you need to contact its sales team. 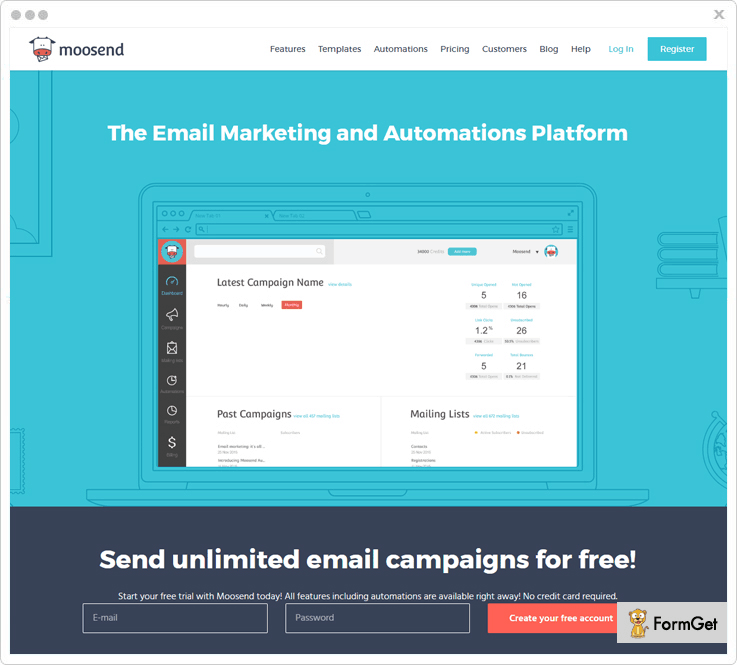 Moosend is prominent and highly used email marketing software. You can integrate it with your favorite platforms such that Zapier, Magento, etc. so that you can easily add new customers that help you to grow email marketing business. Thus, you can also utilize its API that helps you to connect internal services. 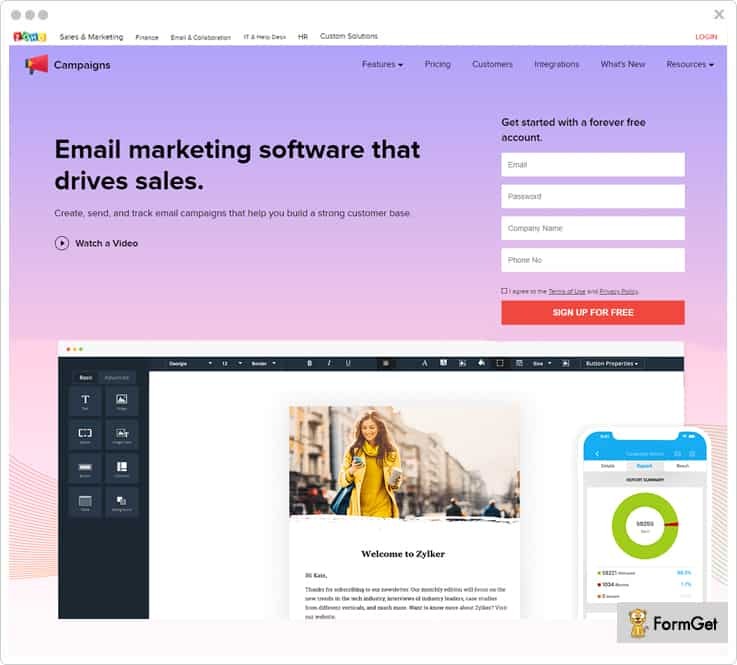 You can seamlessly create attractive and professional emails for your marketing campaigns by using an editor or also use responsive templates that can be customized by adding fields accordingly. Offers inbuilt SMTP service allow you to send the transactional emails fastly within a minute and make sure that email transfer to the user’s inbox without any interruption that will increase inbox deliverability rate. Its automation feature provides you with the functionality that it send emails automatically to a list of people, collect info and utilize time. Moosend helps you to manage mailing list by managing members, custom fields, custom opt-in forms etc. Increase your customer list by using custom opt-in forms that you can insert in the social media and in your websites and that all didn’t require any technical knowledge. Send unlimited emails to more than 1,000 subscribers per month. You can send unlimited emails for a $40 plan to more than 8,000 subscribers per month. Enjoy our 6 months and yearly plans that will present you with the rewards of discount up to 15 & 20 percent respectively. Also comes with the “pay-as-you-go” plan that is only for the occasional senders where they have to pay for each email. 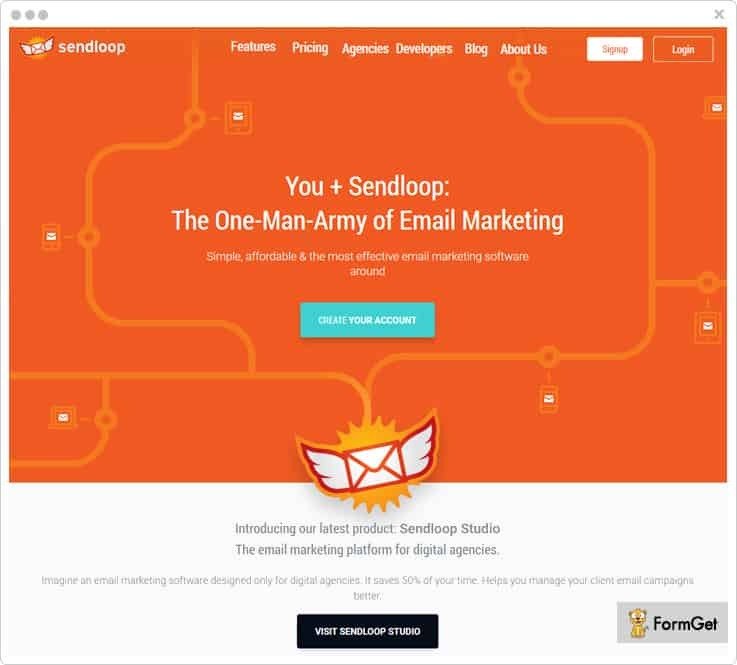 Sendloop is one of the best & affordable email marketing and marketing automation service designed for all size of business whether it is small or a medium one. You can create & send mobile-friendly emails in no time by using features like drag & drop builder, email slicer etc. Also, it provides over 80+ free responsive email templates. The software also contains features like Facebook lead ads, social media sharing & transactional email gateways are some of its highlighted features. Apart from that, more than 36,000+ business owners of 180+ countries are using this product globally. With its scheduling functionality, you can schedule your email to sent immediately or later automatically as per your & your customer’s time zone. You can preview your email before sending to your recipients to check how it looks on inbox. Also, you can check the spam score by sending preview email to your email address, etc. Calculate the real ROI and conversion rate which is generated via your email marketing campaigns through its conversion tracking feature. Its transaction email gateway comes with an easy-to-use REST API which helps you create an email with no complex programmings or no infrastructure set up. Its pricing plans vary from $9 for 500 customers & $1645 for 350, 000 customers per month and in all the plans you will get features like unlimited email delivery, lead generation tools and widgets, 100+ mobile-friendly email templates, 500+ third-party integrations and many other. 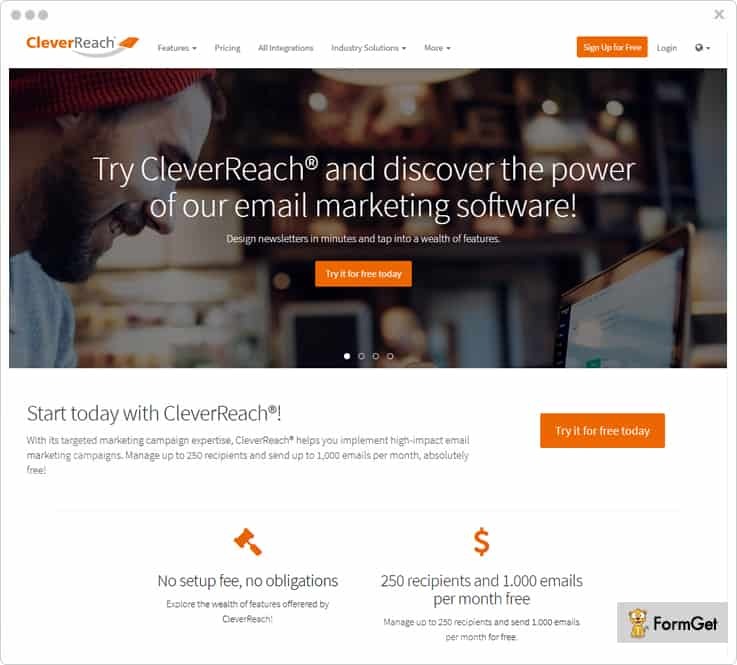 CleverReach is another affordable email marketing tool which enables you to create emails effortlessly. It comes with tons of responsive templates which gives you an instant creation of emails also you can customize the templates as per your need & requirement. CleverReach offers comprehensive integration with various external CRM, CMS and shop systems. This services also allow you to add RSS feed which grants you to create successful email marketing campaigns by adding dynamic contents to your emails. It provides you with the autoresponder feature that allows you to send automated emails to the recipients or send follow-ups to those who did not open the emails. You can manage recipients details by a multitude of options like segmentation of recipients, automatic bounce management, blacklist details etc. It allows you to maximize the success of your email marketing campaigns by doing A/B Split Testing of your newsletter campaigns. This software contains the whitelisting server which ensures the higher delivery rates as it certified by Certified Senders Alliance (CSA). To create & send 1,000 emails to the unlimited subscribers this service will cost you $30.38 per month. For 5000 emails this plan will charge you $46.78 every month. To create 25,000 emails for unlimited customers every month, you need to pay $268.13 undoubtedly. For the creation of 100,000 emails for unlimited recipients, you have to pay just $1489.28 every month. Moreover, if you want to send unlimited emails to 500 recipients, this plan will cost you $17.56 for each month. 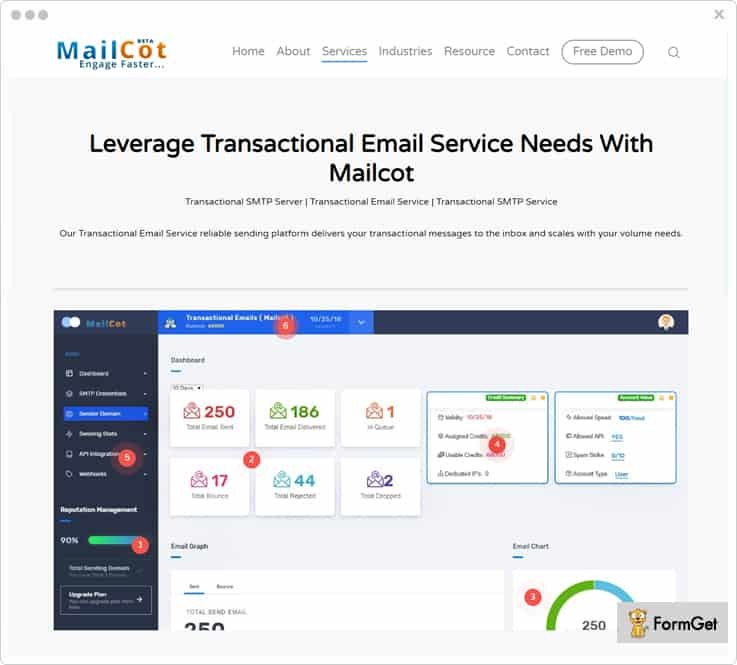 MailCot is one of the user-friendly email marketing software which is trusted by over 5,000 paying customers across the globe. Every month more than 325 millions of emails are created & deliver by using this platform. Its drag & drop editor allows you to create emails for any niches. However, its marketing automation functionality of it helps you to automate your email marketing to achieve more leads. Moreover, coming to its achievement then I must say MailCot is trusted by 8000+ customers like Quick Heal, OYO, UrbanClap etc in more than 54+ countries which is really appreciable. You can personalize the emails & its contents whenever it is necessary as per your requirement. Once done with creation, you can send the emails immediately or schedule for later via its drip & scheduling feature. It comes with a pause & resumes sending functionality so that you can pause or resume the emails at the time of live delivery. MailCot offers you a live testing/preview functionality so that you can preview the emails before sending to the customer. SBPlan-1 – At $6, this plan will allow you to send unlimited emails to 1000 contacts. SBPlan-2 – This plan will cost you $10 to send emails to 2000 contacts every month. SBPlan-3 – You will have to pay $30 for this plan that will allow you to send unlimited to 5000 contacts in a month. SBPlan-4 – To send email to 10000 contacts, this service will charge $55 a month. SBPlan-5 – If your limit is to send emails to 15000 subscribers then you just need to pay $70 only. 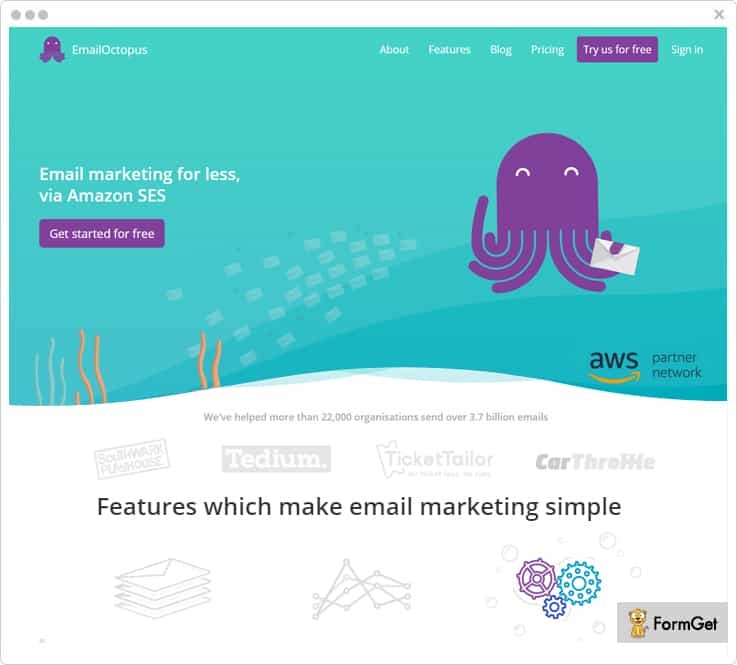 EmailOctopus is one of the affordable & reliable email marketing tools for 4 years. The software is trusted by 22,000 users globally. However, it comes with tons of email templates which provides you best platform to create the emails in just a few clicks. Apart from that, once you are done with creation, this service will further send your emails through Amazon’s SES so that you can send emails to your subscribers without any complexity. By using EmailOctopus you can create & send billions of emails in a year. It has a greater inbox deliverability functionality which guarantees you to deliver the emails in the inbox of your customer. EmailOctopus autoresponder functionality lets you send automatic emails to your customer when needed. It has a powerful automation which you can use to create time-based & drip sequence emails. The service provides a hosted forms to collect email addresses of your subscribers without any complexity. It comes with a real-time tracking functionality so that you can easily analyze the overall your email campaigns’ performance & response of your customer. This service contains various pricing stages on both monthly & yearly basis but we have covered only monthly plans of this services. Tuna Plan – This starting plan of EmailOctopus will cost you $19 to create emails for 10,000 subscribers. Stingray Plan – For the creation of emails for 50,000 contacts you will be charged $39 every month. Shark Plan – This shark plan will allow you to create emails & send to 100,000 subscribers at only $59. Whale Plan – If your limit is to send emails to 250,000 subscribers per month then you have to pay $109 and you can get tons of features like campaigns, automation etc. Zoho Campaigns is a winner due to its services & performance. It is one of the ideal choices for every small sized, mid-sized or large-sized businesses. It automates the entire email marketing campaigns from creating to sending the emails to your subscribers. Its pre-designed templates and layouts along with HTML editor make easy for you to create engaging email, social & newsletter campaigns. Once done with creating, you can also send & track those emails as well. Zoho Campaigns works with various services which helps you to bring more subscribers such as Zoho CRM, G Suite, Facebook, LinkedIn etc. You can immediately send & schedule email campaigns as per your recipient’s’ time zone so that they will receive the emails at the optimal time zone. It has got subscriber management where you can manage your subscribed or unsubscribed details. Zoho Campaigns also comes with a variety of sign-up form templates through which you can create & add engaging sign-up forms into your site. It comes with a geolocation feature with which you can know your recipient’s location both real & passed time. In fact, you can also get the overview of your campaign’s performance on social media as it comes with social media tracking. To create & send 1 – 500 emails up to your customers then this starter plan will cost you $3. For 1,001 – 2,500 emails this plan will charge you $15 per month. To send 5,001 – 6,000 emails to your tons of subscribers then you need to pay $28. If your limit is to send 95,001 – 100,000 emails you need to pay $200. 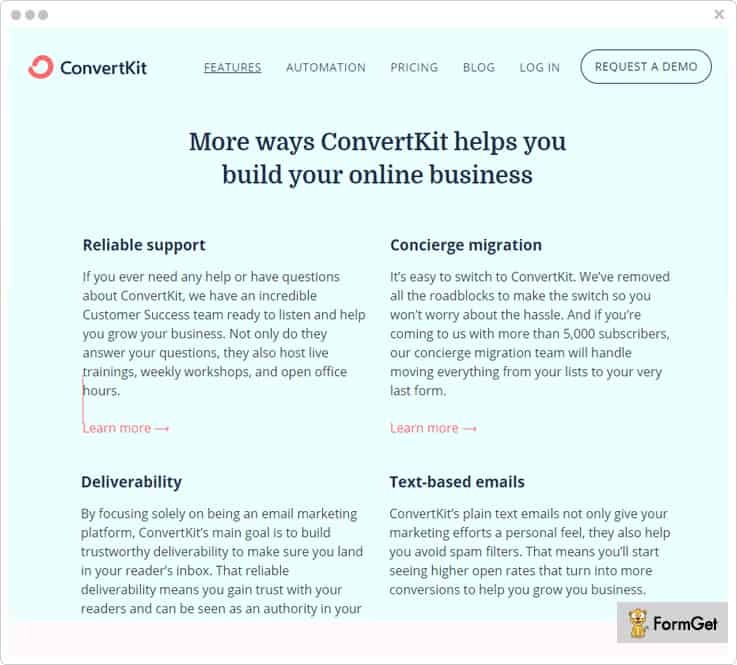 ConvertKit is a cloud-based email marketing automation which lets you create an impressive email template on its platform. It has got numerous fancy & professional templates which help to create a business as well as any other emails. ConvertKit has feature contains drag & drop editor, workflow automation rules, landing page templates, email sequences and so on. Further, you can also create responsive custom opt-in forms and embed them anywhere on your site you want either it is on sidebar & bottom of the site. You can grow your business through its real-time tracking feature with which lets you analyze the performance of your email campaigns & your customer’s response over it. Its automation feature do tedious work for you to send emails to your targeted audience at a specific time interval. You can get a sequence builder through which you can create & send the emails to your subscribers according to the events. Also, you can set drip emailing functionality which facilitates you to send automatic emails to your subscribers at a pre-defined time. The first plan of ConvertKit allows you to create & send unlimited emails to 1k subscribers at $29. To send unlimited emails to up to 3k subscribers it will charge $49/month. And get numerous of advanced features like reporting, subscriber tagging etc. If you want to send emails to up to 5k contacts, you need to pay $79 per month. And you also get features like visual automation, customizable forms, powerful API etc. If your limit is to send emails to 7500 customers then you have to buy this plan which cost you $99/month. [Note – You can try free trial of these plans for 14 days before subscribing to its plans]. 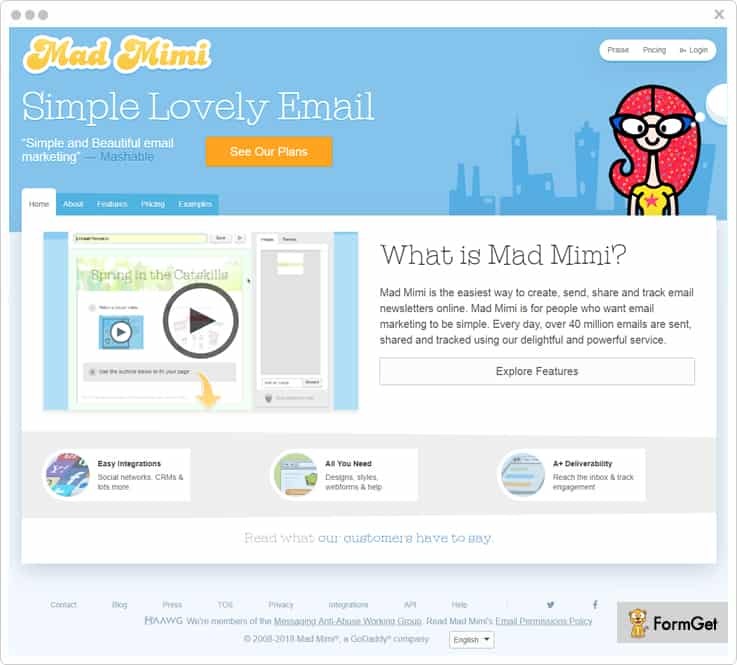 Mad Mimi is one of the easiest platforms where you can create the email campaigns & newsletters and later send & track those emails effectively. It received 5 out of 5 stars in email creation. If I talk about the features, Mad Mimi has got several useful features to make your service more impressive such as autoresponder, great relationship with ISPs, great inbox delivery of your created emails and so on. Maid Mimi is specifically designed for those who want email marketing to be simple. It is natural to use which requires no any additional skill to use this service. Every day, over 40 million emails created & sent using this delightful email marketing software. Its list management functionality lets you manage bounces and unsubscribes, unlimited lists, contact list, segmentation and much more. Mad Mimi contains tracking & reporting functionality through which you can get a real-time result of your email campaigns and know what your customer thinks about your email via their response on your email. It also provides various integration to make your email marketing even more effective such as CRM, CMS, social integration, website builder and much more. The service also comes with a multitude of add-ons which you can add if required like Webforms, Facebook Sign Up, Drip Campaigns, Promotion Tweaks etc. Basic Plan – It is an initial plan which charges you $10 to create & send unlimited emails to 500 contacts every month. Pro Plan – This pro plan will allow you to create & send unlimited emails to 10,000 contacts at $42. Silver Plan – To send emails to 50,000 contacts then you have buy this plan at $199 and get 3x extra speed to send emails. Gold Plan – For sending emails to 350,000 subscribers this plan will charge you $1,049. Note: You can also customize the plans as per your needs & get premium support, full features, unlimited storage etc. I hope this article helped you to decide & choose the best platform to create emails. Though I have covered the features and pricing of every service in this blog which makes you more comfortable to select the best one. In fact, some of the services in this blog comes with a video tutorial which will be helpful for your guidance. So, I would suggest you try one of these services for a once and share your experience & thought with us via the comment section. Drop in your feedbacks in the comments section!